"Most people think "homeless" means living on the streets or in homeless shelters. But homelessness also includes those who live in vehicles, stay with friends or relatives, or in unfit and overcrowded conditions. Some people are temporarily homeless, while others are permanently homeless." The first story in this new book about remarkable kids doing amazing things features Hannah Taylor, a 16 year old from Winnipeg, Manitoba. When she was only six, a chance sighting of a man eating out of a garbage can on a cold night made her heart sad. She needed answers from her mother about how such a thing could happen. Her mother answered those questions as best she could, and then suggested that Hannah might think about a way to help...that might ease the pain in her heart. Hannah talked with her teacher, her classmates; together, they raised money intended to help the homeless. She knew ladybugs to be good luck charms. So, she painted more than 1,000 baby food jars to look like ladybugs, and set about asking people to donate their spare coins. Ten years later, she has written a book (Ruby's Hope), founded two charities (The Ladybug Foundation, The Ladybug Foundation Education Program) and continues to make change. Today, as happens every January 31, she leads the walk for a fundraiser called "Walk A Mile in Their Shoes on National Red Scarf Day". A scarf is needed today when the wind chill in most of Manitoba has been hovering between -30 C and -39 C!!! "With a supportive family, an accepting group of friends, and a sky-is-the-limit attitude, Hannah still has many plans and many lives to touch." There are 14 stories here, each inspired by the 'pay it forward' perspective these kids have taken. They range in age from 10 to 19, and live in Canada and the United States. They were all inspired to make a difference in their world, thus changing the world at large. Others couldn't see what they saw; so, they got to work to share a passion and help beat the odds. They encouraged others to join them to 'pay it forward', and they continue to work for causes that matter. They remind each one of us that there is so much good in the world, and we must embrace it. Each new chapter introduces readers to an outstanding world citizen with a cause...whether it is human trafficking, proper eyeglasses, collecting pennies, earthquake orphans, human rights, community service, care packages for soldiers, non-profit charities, gifts for sick kids, books for those who have none, equipment drives, clothes for Chinese New Year, or Kind Campaigns to counteract bullying, these kids were inspired to take one small step that often led to much bigger things. Photos, webs, information boxes, quotes from well-known leaders are included in each of these chapters and form an important part of this impressive and inspiring book. You cannot help but be astounded by their extraordinary spirit and drive to make their world, and ours, a much better place. Remember, you can do it, too. Start small. "There are opportunities to pay it forward all around you every day. Hold open a door, give someone a hug, share your lunch, rake leaves for a senior, read to a toddler, give out genuine compliments, or walk your neighbour's dog. The list is endless." '"Don't," said Colin between breaths. "Please don't do that." Too late. Stan stole the ball and took it into the paint for an easy basket. Colin watched, attempting to identify his emotions. Anger and fear he knew well, but another unfamiliar feeling had presented itself: disappointment. In that moment, Colin realized something very important about himself. He didn't like to lose." "Colin stopped in his tracks, a learned response to his father's kind but commanding voice. He turned toward his father, head tilted down, avoiding his gaze - not out of shame, but because Colin avoided any gaze unless absolutely necessary. It had the effect of making the boy seem perpetually sad, although he almost never was." He uses charts and pictures to understand the social cues given on the faces of the people he meets. He doesn't like to be touched, avoids looking directly at schoolmates and teachers, and is deeply disturbed by all loud sounds; in fact, his most common reaction to a loud noise is to bark like a dog. It causes gross misunderstanding for many who come in contact with him. While he is learning to deal socially and emotionally with the difficulties in high school as they present themselves, Colin is a math whiz and like Sherlock Holmes, has an uncanny ability to notice things that are happening around him and finds it incredibly easy to make connections that others cannot see. Sherlock Holmes is a hero to Colin. When a gun goes off in the cafeteria, Colin is quick to note that Wayne, the resident bully, is not to blame. Determined to solve the mystery and find the real culprit, he enlists Wayne's help. He lies to his parents (for the first time in his life) and sets off to try to prove his theory. It could be dangerous! 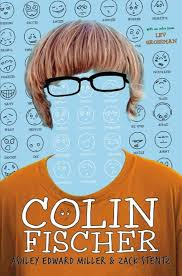 Told with wry humor, this book will quickly immerse middle grade and young adult readers in Colin's story. Once started, I had great difficulty putting it down. There were places where I laughed out loud. I did go back to reread favorite passages and will surely be recommending it for sharing in middle years classrooms, and for those who love character driven books. Colin is an amazing young man, fully developed and sympathetic in every sense of the word. Minor characters have great presence in this memorable book. His parents are loving and supportive despite some very difficult times, his younger brother is understandably jealous and embarrassed, Melissa helps him whenever she can, his new friend Wayne is bewildered by Colin's need to make things right, his coach is someone we would all love to have on our team. Don't miss the endpapers which offer a clear look at Colin's view of his world! Let's end with the hope that we WILL meet Colin and Wayne in the future. 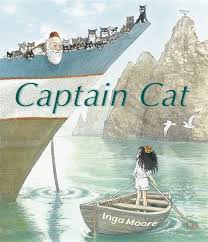 "Which meant that, although he wasn't lost exactly, Captain Cat now sailed on an unknown sea. And he was just beginning to wonder if he would reach the edge of the world when all at once he came instead to a remote and lonely island. "Hooray!" cried the Queen of the island when she saw she had a visitor." "It has to be said that Captain Cat wasn't really a good trader. Trading is a bit like swapping. You swap something you don't want for something you do. Only what Captain Cat wanted more often than not, was a cat. Which is how he ended up with so many." When he tired of trading, he sets sails for those places he had never visited. He might not have another chance! He heads off in a different direction, not knowing that a savage storm will soon send him miles off course. He has no idea where he is now. As luck would have it, he soon finds himself nearing a 'remote and lonely island'. A young and excited Queen is quick to welcome him to her home. She is enamored of his feline companions, having never set eyes on such engaging creatures. She invites the Captain, his crew, and his cats to join her for lunch at the palace. As soon as the soup is served, the tables are overrun by RATS! The young queen is frantic. The visiting cats are quick to solve that problem. "They made it quite clear where they wanted to be, and it was not on the Carlotta. They had been living on that little ship too long, and after enjoying the freedom of the island, where they could do what they wanted, where they wanted, and when they wanted, they refused to go back on board." 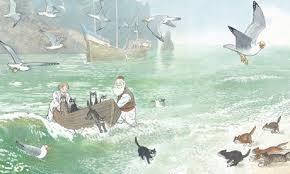 Thus, the captain leaves them in the Queen's care and sets his path for further adventure; but, he soon misses his cats and heads for his home port. When he tells his fellow traders about the many riches he has acquired in trade, they are off. Surprise twists will keep young readers keen to know what might happen next. Inga Moore has created a watery world in mixed media illustrations that will charm and delight all who share this marine adventure. They evoke loneliness, fear, warmth and humor...all very important to the events of this well-told tale. 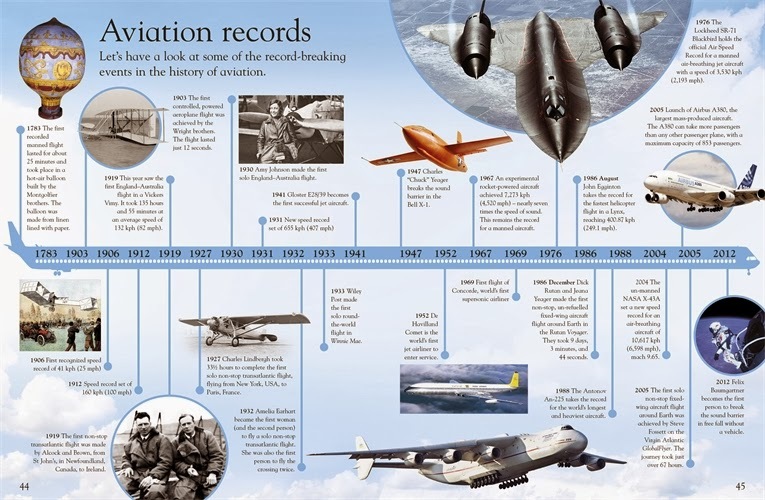 "For years, pilots struggled to control their planes when they got close to the speed of sound (750mph/1,196 kph). This fearsome sound "barrier", known as Mach 1, was crossed by the X-planes, an experimental series of aircraft built to break all previous records. The rocket-powered Bell X-1, flown by fighter pilot Charles "Chuck" Yeager, was the first plane to break the sound barrier." Now, here's the second, and equally awesome, book from the Eye Wonder series that I want to tell you about today. 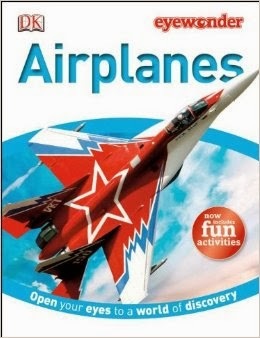 As DK does so well, it is a book that will inspire wonder in young children who long to know more about flying and the amazing machines that make it possible. The photos are exceptional and offer visual images that make all understanding clearer. "Sketches show that Italian artist and scientist Leonardo da Vinci had put some thought into ways that people might fly. His notebooks contain a series of drawings for machines called ornithopters that had flapping wings." From dreams to gliders, to first flights, biplanes and supersonic jets, we see the development of these machines and get a glimpse at what might still be ahead for us. Readers are first class passengers for an explanation of how flying works and how it has changed the way we do things in our world today. 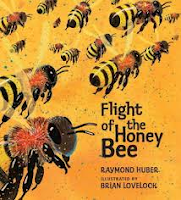 If you have read other DK publications, you know that children who share this book will have eyes opened in wonder at the marvels of flight, and the progress shown since the Wright Brothers made their first powered flight, using lift, power and control in December 1903. Scientists have not looked back since then, and continue to power us forward. Just last week, the names of those people who have been chosen to make the first flight to Mars were released! Did you ever think that would happen? Rainforest, Mammals, Volcanoes, Whales and Dolphins, Explorer, Reptiles, Dinosaurs, Pyramid, Forest, Big Cats and Shark to name some of them! Quite the library, don't you think? "Everything you do is controlled by your brain. It's a little like a computer, but far more complicated - and it only weighs 3 lb. (1.3 kg)! A simple drink requires a lot of brain power. Your eyes and fingers send messages about what you see and touch, while your nose and tongue help to smell and taste the contents." 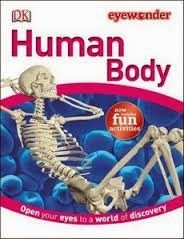 This is a terrific and very informative first guide to all a young reader might want to know about the human body. In two page entries, the workings of the body are explained with just the right amount of information for those children not yet ready to explore the much more complex Eyewitness series. "All bodies are made up of organs. Skin is an organ. It is wrapped around a framework of bones and other organs such as the heart, the brain and the lungs. Organs work to keep you alive, and each does a different job. 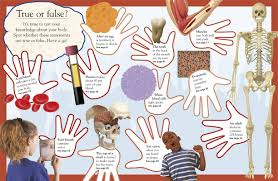 Organs work together to make up systems, such as the muscular system and the circulatory system." From babies and belly buttons, to the skin, the skeleton, the hair, the muscles, and so on, children are introduced in a clear and accessible way to the workings of the body. 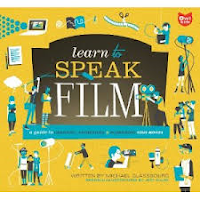 Filled with engaging, often astonishing, photographs and just enough information to keep them reading more, this book encourages their learning by making it fun. The writer ensures that the language is accessible to younger readers, using captions and sorting the information into small bites. There are three interactive double page spreads at the end. One is a true or false? quiz, one is a facts matchup, one is a what's this? set of close-up photos, and the last one is a brain maze. All are meant to have readers think back on what they have read. Each provides a page number for checking answers. A glossary explains new vocabulary. 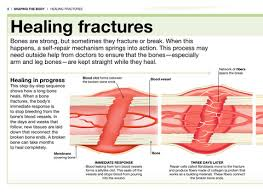 "Bones are strong, but sometimes they fracture or break. When this happens, a self-repair mechanism springs into action. This process may need outside help from doctors to ensure that the bones - especially the arm and leg bones - are kept straight while they heal." The Pocket Genius series is perfect for young readers on a quest to find out all there is to know about a variety of subjects. They are packed with information that can be easily accessed in the table of contents, and again in the glossary and index. All are reliable and most helpful for finding what you want to know. The information is up to date, and often surprising. Kids love facts, and you will be aware of those children in your family or classroom who seek books that will provide them with what they need to know. Many young people want the facts, just the facts, about their own body. Here, they will find a well designed guide to provide clear, captioned photographs and illustrations and a close look at all the workings of the human body. Chapters are arranged to give readers a clear look at being human, with information on bones and joints, blood and heart, lungs and breathing, digestion and waste, brain, nerves and senses, and the life cycle. From the trillions of tiny cells that make up our bodies to the inherited genes that 'contain the instructions needed to build and run the body', we learn what a truly amazing machine it is. A quick recap of the book is included in the back matter, with bulleted, significant points repeated for quick reference. This is an excellent resource for middle grade learners. Other books in the Pocket Genius series include Animals, Dinosaurs, Rocks and Minerals, Sharks, Ancient Egypt, Earth, Bugs, Space, Horses, Mammals, Science. "But that's not how Puggy rolls. Instead, she gives her love freely, holding no grudge against the scent of newborn that was once mingled with smells of waste and filth. In fact, perhaps her old life is why she is such a generous being. She's known hardship and doesn't want any other animal to suffer." Perhaps that is why, when Tabitha showed up at the Hillside Wildlife Sanctuary in Norfolk, England, Puggy went resolutely into mother mode. She fell immediately in love with the wee piglet, protecting and coddling her. You don't really need to know the whole story to know that in this companion book to Unlikely Friendships (Workman, 2011) you will find stories to read, to love, to share with others. 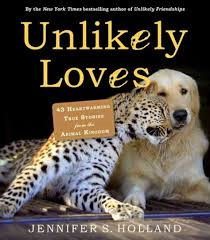 I mean, just look at the cover and tell me you don't want to know how a leopard and a dog come to be such great pals. There are 43 stories here and each of them takes the same pattern for presentation. They are dated and the location is noted. The entries are accompanied by lovely, warm and clear photos of the matched pair, as well as information boxes describing their scientific place in the world. They tell stories of surprise, patience and enduring love. "Piper went straight to the goat and starting licking him. "She licked and licked it all over, and after a while, the goat started to come around. It's as if it suddenly came to life." Piper and GP (Goat Puppy) were like mother and son after the dog revived the little goat that night. Piper would clean little GP's milk-coated chin and lovingly wrap herself around him as he napped. GP would take dog walks with Piper, Julie, and Nate - a goat on a leash." You know the impact animal stories have on each one of us.. What's better than to start your day (or end it) with a story of unlikely love? It will warm your heart from now until the end of February...I Love to Read month! I must take a bath. But I've had one before. it's time now for sleep?" This is the fifth CD and illustrated songbook that Sandra Boynton has written to entertain her biggest fans and their parents. This time she turns to country music, and she has some terrific artists singing her 12 songs. The themes are recognizable to country fans...trucks, summer storms, heartache, and much more. Some of my favorites are here: Alison Krauss, Brad Paisley, Kacey Musgraves, and Darius Rucker. Each song has its own distinctive style and rhythm, and is accompanied by those signature animals that her audience has come to love in many popular books. Once you have listened to the songs, and had a chance to take a look at the lyrics in the Look While You Listen section, you can move right on to the Sing & Play Along part of the book, if you are so inclined and have the musical smarts to do that (unfortunately I totally lack such skills). These are talented musicians, working with a prolific songwriter and an accomplished production team. They show how much fun country can be, and just how skilled so many of our country artists truly are. The humor will encourage family listening, and repeat performances. 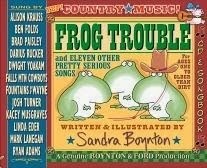 Sandra Boynton rounds out this new music collection with an opportunity for new learning on a page called How to Talk Like a Cowboy. Then, we meet the performers, and the musicians who make this charming new CD come alive! If you are so inclined, there is also an opportunity to learn how to make a folded-paper frog puppet. Then, you will have a singing partner should you like to share your new repertoire. 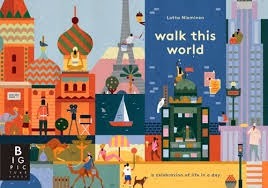 In another stunning debut, Finnish artist and graphic designer Lotta Niemenen creates the art for a walk around the world, beginning in New York. Writer Jenny Broom deftly crafts the sparse poetic descriptions for each new destination, starting with the busyness of a NY morning and returning there at the end of a long and glorious day. underneath we're just the same." The glorious and beautifully designed double page spreads entice globetrotting readers with more than 80 flaps to be lifted. The color palette offers visuals inspired by each of the countries visited. It takes patience and is worth every bit of exploration to see what the illustrator has in store for her audience. Under each of the flaps are tiny stories: a patron admires the art at the Guggenheim in New York, bakers prepare daily deliciousness for their customers on a Paris street, a woman and her chicken ride a bus in Africa, tourists experience the lean at the Tower of Pisa, in Russia a pair of ballet dancers practice at the barre, an ice cream vendor sells refreshing ices on a Brazilian beach, a swami plays soothing music for a cobra, a shark menaces surfers in Australia, an English bobby keeps watch outside the Prime Minister's residence in London, a tea ceremony is prepared in Japan, and finally, a mother reads a bedtime story to end this fascinating day. Sure to inspire questions about children and cultures of the world, this is a book meant to be shared one on one, or in a small group, as there is so much to see and to discuss within its pages. Young readers might be surprised at the many similarities they discover, while also noting some of the differences. Bless Candlewick Press for the brilliant books they publish for us every single season, and for finding the authors and artists whose books they bring to our attention! 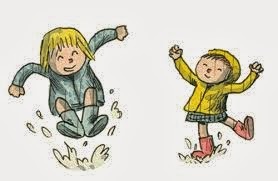 In his American debut, Argentinian cartoonist Ricardo Liniers Siri shows us that he most definitely understands the childish delight to be found in a rainy day. Oh,his daughters Matilda and Clementine, who provided the inspiration for this new TOON BOOK, do, too! Matilda begins the day waking her little sister with promises of adventure. It's Saturday and everything is better on Saturday. So, they arise, have breakfast, with Matilda talking all the while. A glance out of the window has Clementine feeling blue. Matilda is reassuring, explaining that rain is FUN. 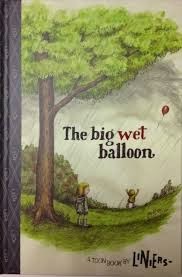 Giving instructions to prepare for the rainy outdoors is a bit frustrating, with misunderstanding causing a few laughs. Finally they are off...well, Matilda is ripe for running and jumping and enjoying every watery minute. Clemmie prefers the dry porch with her teddy. She's not convinced she likes WET. It takes some effort, and a few incentives. But, it's worth it when the two share the awesomeness of a rainy day and the shimmering beauty of a rainbow. A gift to the rainbow is called for, a treasure lost and found, and the day ends with a touch of surprise. In this endearing graphic novel, the artist entertains his readers with the joys and surprises of a family adventure. He creates warm images, and adds a perfect measure of humor to keep his audience attentive to the heartwarming details as the two sisters explore the wet world around them. If you are looking for books that inspire early reading, this is a book for you! Gabby loves to daydream. It makes every day for her better. That daydreaming helps her through having to listen to her parents' arguments, and escalates when her father moves out. Now, Gabby lives with her mother, who is in no way a dreamer. It is a difficult existence. Living with her mother, visiting her father all the way across town, and attending school where her inattention is causing her even more grief, she finds the days endless. Gabby is not only a dreamer, she is a gifted poet. She shares her feelings with us. I know not to expect more. You want to know Gabby. She speaks the truth. Her poems are a celebration of her days, her family, her dreams. Meeting Mr. Spicer is the kind of experience I wish every single child who attends school might have. He has expectations of Gabby for school, and he ensures that she has time to daydream and write every single day. It is a curriculum change that impacts every student in his class. 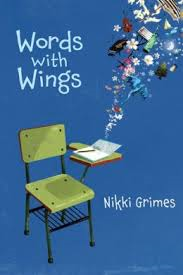 The awe I feel for Ms. Grimes and the other incredible poets who write for our children never diminishes. Rather, it grows exponentially when we have the chance to read such beauty in words. 259 eggs in one year." DK does it again! My mouth is watering and I am wondering whose little one I might kidnap for a few days. That way, we could try some of the delicious recipes in this brand new, beautifully photographed cookbook for children and their parents. It can't be confined to Mommy taking the time to share the joys of doing something special with a young and eager child; dads will be interested, too. There are the usual recommendations for health and safety: adults need to help, instructions to be carefully read and a balanced diet taken into account. The table of contents shows that we are going to learn something about eggs, flour, pasta, rice, tomatoes, potatoes, peas, chocolate and strawberries. When I was reading this before lunch, I was certainly happy that chocolate and strawberries were left to the end...too much temptation! As we have come to expect from DK, they consistently offer superlative nonfiction for children and their parents and caregivers. This is no exception. There are carefully captioned photographs at every turn of the page. A multitude of facts are included to help children understand the importance of the foods and recipes that they will find on its pages. Each of the ingredients is clearly shown, and a numbered method for preparation is provided. The clean, clear and colorful photographs of the foods that are being prepared are literally mouth-watering and very appealing for small children. It's hard to come up with new meals every day. 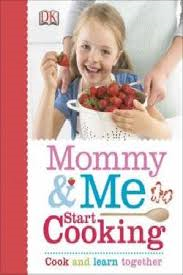 What fun to get the kids involved in recipes that are simple to make, and oh, so yummy, too! Get out your aprons, pick a page and set yourself on a new culinary adventure! It's been a very long time since Art & Max, (Clarion, 2010) and I have missed David Wiesner's terrific talent. 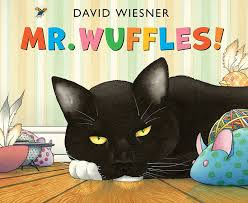 Thankfully, we now have Mr. Wuffles to admire, and to share with all who are sure to be intrigued by a cat with a penchant for shiny new things. His owners do their best to find a toy that might interest Mr. Wuffles. It matters not. Mr. Wuffles is not easily pleased. In fact, he is downright insolent when a new toy is offered. In the horizontal title page spread we are made aware of just how difficult it is to please him, as he wanders past a long line of toys, price tags still attached. We are quick to note that the shiny metallic spaceship has no tag; in fact, it appears that there are creatures living inside it...space creatures by their look and their language! We can only guess at what they might be saying to one another. Too soon, they are aware of bold yellow eyes at the window, and their world tilts! Mr. Wuffles has finally found a toy that captures his attention; but, it is NOT a toy! It most certainly is not. It is a curiosity to this inquisitive feline. He tires of it quickly, and leaves the 'toy' alone while taking a quick nap. In the meantime, the aliens are desperate to get help in fixing the damage done to their equipment. Off they go, with Mr. Wuffles intrigued and in pursuit. The cat is easily distracted by a ladybug, allowing the aliens a welcome escape. A twist in the tale allows the aliens a secret hiding place, and a most telling meeting with the many insects who live under the radiator. Obviously, they do not speak the same language. Detailed drawings of battles between the insects themselves and various cats allow a mutual understanding, followed by a few photo ops, a shared meal and the materials needed to repair the damaged spaceship equipment. Banding together, they outsmart the befuddled cat. The aliens can make a dramatic exit. Poor Mr. Wuffles! His menacing stare and protruding claws are useless in the wake of the alien escape. A new toy means nothing. Our last glimpse has him poised to pounce, and patiently waiting at the radiator cover, behind which the insects are adding new information to their story wall. What a world he has created! Detailed, beautifully orchestrated and funny, this is a wordless wonder! ONE MINUTE! It takes only one minute for Bob Graham to inspire, enchant and show his readers and listeners how truly momentous that tiny slice of time can be in our daily life. At 9:59 one morning, Jodie is about to put the final silver button on the duck's black boot in her newest artistic masterpiece. She stops to think about her work. As she does this, her baby brother decides to take his first step. Their dog appears wary of Jonathan's lurching approach. As the two keep themselves busy in the living room, their mom is using her artistic talents to make Irish music on her pennywhistle. It is a quiet family scene. At the window we notice a woman in a bright blue headband passing by. A turn of the page and we are outside the family's home, eager to take note of what is happening there. So many other important things are taking place. We are engaged participants in observation as the world widens and we become aware of the goings-on in the city, all in that same moment in time. It is a fascinating view of a multicultural community experiencing life's many joys and sorrows. Bob Graham is a skilled artist and superb storyteller. That is again evident in this serene, and beautifully crafted book. The variation in the images that he presents will capture the attention of those who are reading. Those who listen to his lovely, lyrical text will want to take the time to pore over the many inspired details, and to talk about them. I find myself going back again and again to take note of just one more connection. It is never busy, but always engrossing. It is full to the brim of meaning, and moments that are rarely interpreted with such wonder. Thank you, Bob Graham. This is pure delight! You've heard similar words between friends, haven't you? If you work or have worked in a school, or have children of your own, I know that you have. Too often, the results are just what happens with Fish and Snail. Both angry, they make a choice that is sure to hurt their hearts. In the days before their falling out, Snail can't wait for Fish to return home to read their book. 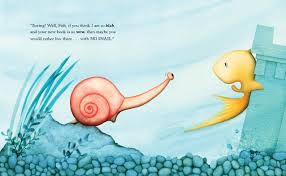 Fish is an adventure seeker; one day, he comes home with news of a newfound book and he wants Snail to see the book, rather than just tell him its story. Snail is apprehensive. He likes things the way they are. He likes their book, and doesn't really want to venture beyond its safe pages. PIRATES scare him! He likes kittens. Fish is mad and brings an end to their story. Poor Snail...he is so sad. He doesn't like this ending. When he leans over the edge to get a glimpse of Fish in his new watery world, he knows that life will not be the same without his best friend. He takes a leap of faith. 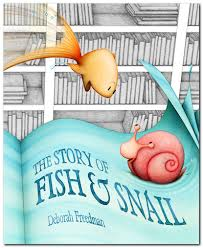 I like this story-within-a-story format, and I think her readers will be captivated by Ms. Freedman's ability to create two such opposite creatures who are really the best of friends, for the most part. The watercolor art is wondrous! 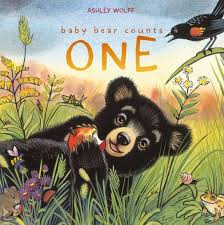 Sweet Baby Bear is back in a book about numbers and the seasons, following up on his discovery of all the colors in his world (Baby Bear Sees Blue, S&S, 2012). This time he and his Mama take stock of the world around them as the animals of the forest make preparations for the coming winter. Baby Bear is learning to count. In fact, after asking Mama about the clapping, he moves to the edge of the pond to count three very busy beavers! The onomatopoeic sounds are the only noises the two bears hear as they themselves eat what is available to them. Patient and instructive, Mama answers her baby's many queries with helpful information about the ways of the natural world. Linoleum blocks are printed in black and colored with rich watercolors. The images are replete with details that are sure to have those who share this book leisurely exploring the bears' world, and enjoying the ever-changing perspectives that allow them to share a bird's eye view, a close-up and even an ant's eye view in the grasses as he happily counts seven bees (including the one on the tip of his nose). their habitat. A turn of the page for the appropriate practice in counting offers another full page spread which affords readers time to practice, too. Their investigation is done all too soon, and winter arrives with the soft delight of snowflakes...uncountable! An apt portrayal of life in Manitoba on this dreary January morning. Ah well, we are on the downhill slide toward spring, or so we hope. meant to be loved by all! The adventurous and endearing Daisy returns for an encore, in this nearly wordless tale. Her ball is blue this time; but its willingness to be chased is similar to its red counterpart. Daisy loves chasing! The tendency for tracking leads her into a new kind of trouble. unconcerned squirrel. Intent on making a game of chase with a new target, Daisy sets off at a quick pace with capture in mind. The squirrel proves adept at evasion, running into the forest and up a tree. Only then does Daisy realize that she has no idea where she is, or how she got there. Her owner comes to the same conclusion at exactly the same time and wears an identical look of horror. She calls loudly, and often, for her pet. That calling and Daisy's howling set them on the right path to find one another. A happy reunion is the only feasible ending for the two pals! Chris Raschka has a unique gift for captivating his audience with the force of strong emotions. He uses ink, watercolor and gouache to create another wonderful book with Daisy at its core. She is a charmer who has already captured the attention and love of numerous fans. We are blissfully wise to the proximity of pet and owner throughout their ordeal, but cannot help being drawn into the almost calamitous result of a wild chase. 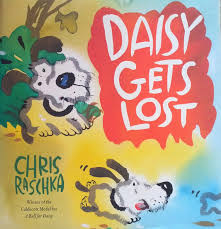 Mr. Raschka's ever-changing perspectives keep the trajectory of this lively new story always at the forefront, and are extraordinarily effective. This sequel to Hocus Pocus (Kids Can, 2011) is just as much fun as the first one. In fact, it might lead readers who did not see that one right back to it. It's a comic book adventure and sure to attract new fans with its quirky characters, its sly humor and its innate appeal for those who love wordless books. A lot can be said without saying one word! This time the Magician, his cranky (at times) dog and his hatful of rabbit are off on a train trip! They have a bit of time before the train pulls out, so decide to stop for a coffee and a quiet sit. Hocus, with his ever-inquisitive eye for adventure, takes note of a purple rabbit close by and tries to get its attention. Nothing works, so Hocus moves closer. After many attempts to get a response from the stuffed rabbit, Hocus turns to see that his 'hat' and the rest of the troupe are on their way out. 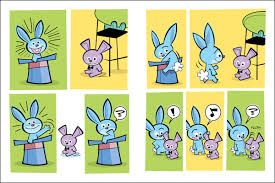 Stymied in his attempt to extricate himself and catch up with his pals, he notices a baby crying for its lost rabbit. Not wanting the baby to be sad, he returns to rescue the purple toy and makes a beeline along the tracks for the last train car, only to be stopped by his arch nemesis, the Magician's dog! 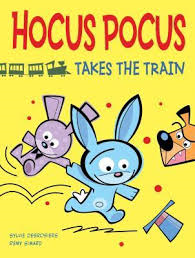 Hocus is much too smart to be left behind; it takes all his ingenuity to fashion a solution to the runaway train. Soon, he catches up, pulls himself aboard ands puts his plan to return the lost bunny into action. It isn't without its difficulties! The dog gets its comeuppance, and Hocus is able to set things right. attention. Sound effects beg to be read aloud, and with expression. The appealing characters are cleverly constructed. It is a story that is both funny and touching, and most assuredly makes us long to see more of this series. are looking for their supper. Don't be fooled into thinking that seals do nothing but snooze on rocks and beaches, whiling away their days in the sun and sand! There is much more to their days than that. On land they seem clumsy and slow, flumping along from one place to another. it's how a seal gets about on dry land. wraps around him like a blanket." 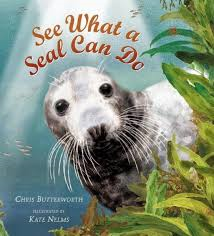 This is perfect nonfiction for kids who are always wanting to know about the animals of the world. It is a celebration in text and art. Chris Butterworth did her research and shares it in a most accessible way, combining a lively poetic text in one font, and adding further descriptive information in a smaller one. 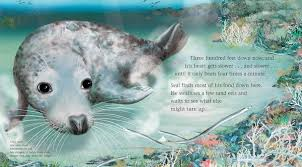 That makes it clear to her readers which tells the scientific story of this particular gray seal, and which gives readers a chance to add to their store of facts about it. Other writers use this same strategy, not always with the same captivating results. This is Kate Nelms' first illustrated book. You will recognize as soon as you see the cover the promising future she has in picture book illustration. The captioned endpapers allow her readers a close-up look at the eighteen different kinds of true seals that exist in ocean waters. The sandy horizon gives way to the beauty of underwater life when the seal powers itself into the light-infused depths. The mixed media artwork is an invitation to young readers to explore the ocean's beauty. There is so much here to learn, and no more perfect way to learn it! 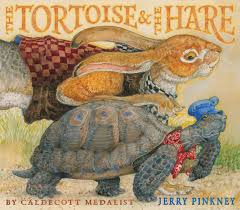 Oh my, that Jerry Pinkney! Aren't we lucky to share his vision for this timeless fable? The endpapers set the scene and allow readers to begin building excitement for what is to transpire. We're quick to note that the setting is a desert, abundant with cacti and critters. The race path is marked and the two main creatures are evident to all who are paying attention. The title page is replete with the many animals set to be observers of the forthcoming action. A bobcat, a vulture, a grasshopper, and a badger are but a few of them. The hare has a challenging look in his eye as he speaks directly to the tortoise at the base of his tree stump. And so, the dare is delivered and the contest is set. The Fox will announce the start of the race! The hare is quickly off, leaving the plodding tortoise in his dust. The tortoise's determination is evident in the set of his jaw, and the purpose in his eye. Those who have heard this tale know the outcome, but certainly getting there is the true delight of the lesson to be learned. The detail and realism created by this brilliant artist make the reader feel as close to the race as the many creatures who grace its pages. 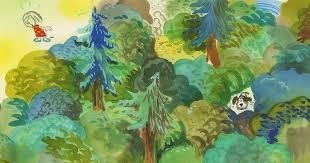 Using mixed media he gives us characters and a setting that captivate and inform, and most assuredly entertains to our great delight. I have pored over the images on numerous 'readings' and each and every time I find something brand new. Amazing! We know the story; but, we have never seen it quite like this. I love that the repetitive refrain of the lesson matches the pace and the perseverance of the forward-moving and relentless journey made by the tortoise. Despite the hare's last minute sprint, he is too late! He is not a sore loser. The final frame shows him tying the victor's scarf on his opponent's neck. Bravo! encourages us to so the same. Hank is pretty little. 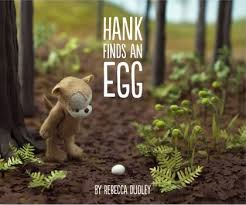 When he finds an egg in the woods, he wants to help. Being small has its difficulties. Hank doesn't let that stop him. He knows where the egg belongs, but must use all of his 'smarts' to assure its return. First, he tucks it safely in a basket and carries it on his back, while trying to find the means to put it back in its rightful place. A short stump may help...not tall enough for the boost he needs. Perhaps a ladder made from nearby sticks? Nope! The sun is setting and Hank must find shelter and warmth for himself and the egg. Tucked safely under a leafy layer, he falls asleep. The morning brings renewed determination to complete his task. Mama Hummingbird has noticed that an egg is missing. Hank gives reassurance that all is well. He fashions a soft nest, ties it with a blade of grass, and hands it tenderly to the tiny mother. She returns it to the nest, while Hank rests happily against a nearby tree. The baby birds are soon born safely, and show their delighted appreciation. Hank might have walked away. What about you? We don't need to tell children what they should do, we need to show them. That is exactly what Hank does so beautifully. No words needed. The collage artwork and first-rate photography give us a front row seat to the rescue and a chance to understand Hank's feelings and actions as his kindness bubbles forth. It's a charmer, and is sure to be shared again and again. And here's the grateful mama, and her hero! "It rolls past wheat and prairie grasses. Past silos and barbed wire. Past a lone hawk circling under a big western sky. The Freight Train rolls slower than slow. So slow it's hard to tell it's moving." Elisha Cooper has done it again! 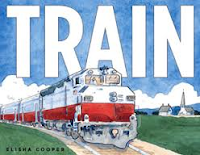 This time he's created a book that awes readers with his love of all things TRAIN! The empty train tracks on the front endpapers lead us straight into the hustle and bustle of Grand Central Station, liberally peopled with those who use the train as a means of transportation for many different reasons. "The engineer sits very still but his fingers are always moving. Pushing levers, turning dials. 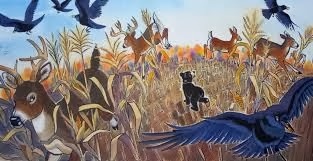 He taps a blue button - long, long, short, long and the horn blares out..."
"It rolls past wheat and prairie grasses. Past silos and barbed wire. Past a lone hawk circling under a big western sky. The Freight Train rolls slower than slow. So slow it's hard to tell it's moving. As if the train and the clouds above were having a race to see which can go slower. Slow, sloooow." Even as we follow its unhurried progress, we meet another train. This time, it's the Overnight Train. Its route is risky with ever-changing weather, long tunnels, and the inky darkness of a moonlit night. In the morning, it makes its way to its next stop. In a flash it is passed by the speedy and streamlined High-Speed Train. It can really fly. When it powers down on its approach to the waiting western station, our cross country adventure comes to an end....unless you read this wonderful book all over again! As he has done before with a beach, a farm, a ball park, a country fair, a evening's walk and even ice cream, Elisha Cooper gives his readers a detailed look at something familiar and memorable. He makes clear to us how train travel works from one coast to another. In simple text, he welcomes us into the world of trains, their variety and their value to the transportation industry, and to us. His illustrations are recognizable to anyone who has seen and shared former works. I love the landscapes that somehow manage to dwarf these giant mechanical marvels. He is able to capture for us the feel for each of the trains that he so aptly describes. It's a real exploration, tantalizing our senses with text and image! 'I rode a lot of trains for this book. Many details are taken from real life (like the clock in Grand Central Terminal). Readers may notice that I combined details (the interior of Philadelphia's 30th Street Station with the exterior of Denver's Union Station) and made some up (The San Francisco station is purely imaginary). So this book is accurate, to a point. My thanks to all the train people who helped me." 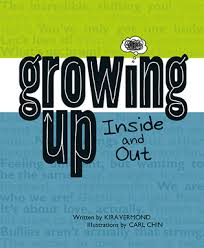 "As a guide to growing up, this is a book that's meant to be by your side for a long time. So if there's something you're reading about that doesn't feel right just now, put it aside. Chances are, you'll be more comfortable reading about it before too long. The point is, there's no reason to rush through growing up - or reading this book!" This is a terrific book, and I would recommend it for any families with children entering puberty. My experience in the library tells me that it is not likely to stay on the shelf long...and may never even be checked out. But, I think I can guarantee it will be GONE! Many kids need the information that Kira Vermond so capably and openly provides in this guide meant just for them. The first few chapters are explanations for the many changes that they will experience...all in their own time and at their own pace. She assures them in her very first paragraph that it is something that we do differently...we are different people. There is a lots to be read here, presented with the intent of informing them of what they might expect. "Hate the way your ears stick out? Wish your chest were smaller? Can't stand your nose? We all have something we don't like about our bodies. But would you agree to have a doctor give you an operation to do something about it?" In this text box titled Under the Knife! she asks those questions, provides statistical data and some of the pros and cons for deciding on plastic surgery. In How Are You Feeling Now? she asks her readers to explore the emotions that they experience in a variety of ways. In Be Careful, Will Ya, Boys? she appears to be speaking to Harris and his cousin (Harris and Me, Harcourt, 2007) and Angel Peterson and his friends (How Angel Peterson Got His Name, Yearling, 2004) and all those guys who do crazy things when they reach puberty. There is a lot of information to digest which is why the author gives her readers the discretion to read it when they are ready, and to keep the book for a long time. If your kids want to know what's happening to them physically and emotionally, this conversation with a gifted and informed author will help them navigate the many bumps in the road that they are bound to experience. Parents, interested adults, teachers, and guidance counselors...get this into the hands of your tweens and teens, and use it to begin talking about issues that may be difficult to explore. It is a great starting point. The back matter includes a list of websites, a bibliography and an index...all helpful and welcome. You color with me, but why? I'm not even in the rainbow." When Duncan sits down to put crayon to paper and draw something very special, he is in for a big surprise. Instead of the crayons he's looking for, he is faced with a box full of letters addressed to him. It's me, RED crayon. WE NEED to talk. any of your other crayons. Are you with me? Each new letter brings a new complaint, and their own good reasons for refusing to work with Duncan any longer. They want a lot of changes to be made. Duncan is speechless...he had no idea! It doesn't take long until he is able to really hear their complaints, and find a solution. He uses his head, and a lot of color, to create just what the doctor (well, crayon box) orders. You know that I a huge fan of Oliver Jeffers and his amazing artwork. 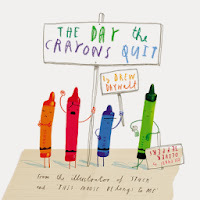 Using pencil, paint and crayon, he brings Drew Daywalt's witty text to glorious life. Mr. Daywalt gives each one of the crayons its own personality and voice. Oliver Jeffers uses all of his incredible talent to bring them to life on the facing page. His art is full of energy and droll wit. Red drips perspiration, in keeping with her much overworked persona. Grey is overwhelmed by the amount of energy used to color an elephant, a rhino, and a hippo when he could be coloring rocks and pebbles. And, so it goes. They honor the kids who love drawing (and who seem to have created this artwork themselves...perfectly). He's always in a rush. and levels trees and brush. although he's big and tough. Oh! 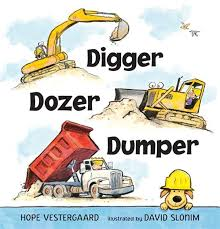 I know that Joey is going to love this book, and any other little one who wants to know about all the big machines and trucks they see working on the streets, or at construction sites. Can you remember how much fun it was to stand and watch the action, admiring the work at hand and amazed by the power of the machines used to get the job done? As we turn from the title page to begin our adventure, we can see that there are others here before us. Three young friends, obviously filled with admiration, look and point and touch the trucks as they are getting ready for their day's work. Turn another page and we begin to make a close association with them. The young lady and her dog are in charge of the street sweeper as it begins its early morning rounds, clearing dirt and grime from the city's streets. The two boys takes their places when their help is needed. On we go, until we have met all 16 big machines and trucks and learn something about the work they do. and checks his target twice. he pours a little hill." I love the bright colors in David Slonim's acrylic and charcoal artwork. Each machine has eyes that express its feelings, and they are sure to draw attention from the intended audience. The children are keen workers, giving it their all to ensure that the work meant to be done is completed. The floppy-eared dog accompanies them as they work. He must be a big help! It's going to be a hit! "The old camel carried large bundles filled with spices, dates, incense, silk, silver and wool. Before each journey, its owner would make it kneel so he could climb on its back and settle on top of all the bundles. Then the camel would stand and start to walk. The camel climbed the steep sand dunes and walked along the tops of them and then lumbered down the other side, almost tumbling over..."
Too often today we forget to walk in another's shoes. We are so wrapped up in how busy we are, and how burdened we are by daily life that we forget to stop and see what life is like for others who share our place in this world. In this quiet, well-told tale, the author encourages his readers to think seriously about the plight of the camel that is one of its main characters. This camel is nameless; but, it does not lack feelings or spirit. Its owner is cruel and unfeeling in his dealings with his beast of burden, working it continually and often without rest. The camel has been doing its job for many years. Now, it is tired and sad to find itself in a neverending cycle of work, work, work. Its owner, Halim, has his own worries and rarely thinks beyond the needs of his day. He is also busy with the expectations made of him. He is lonely, too...always travelling to the next place to sell his wares as quickly as he possibly can. It is no excuse for his obvious mistreatment of the camel. Always hungry and very thirsty, the camel must rest in the sun while his master sleeps in the shade. When the Prophet becomes aware of his plight, he offers a 'shoulder to cry on' and a solution to the problem. In a dream, the Prophet shows Halim the error of his ways, the sadness that is a daily part of his camel's life. Finally recognizing what has happened, Halim has a change of heart. Life improves immeasurably. "When I first heard it, I didn't know that the story came from a hadith - an account of the Prophet's words or actions passed from generation to generation. It was while reading a booklet entitled Animal Welfare in Islamic Law that I recognized the storyline in a translation attributed to Abu Dawud's collection of hadith. It described a similar encounter in a garden: the Prophet discovers an overworked and starving camel and immediately instructs its owner to care for it properly. The message was direct and clear." So, too, is Griffin Ondaatje's tale for young readers. Told in a simple language that allows them access to thinking about compassion and their own treatment of others, it feels very real and honest. Can they think of a time when they might have been kinder? Can we? You can almost feel the desert heat emanating from the book's cover. The sandy dunes and the brilliance of the sun are enough to make me go looking for shade even on this cold, winter day in Manitoba. The setting is so clearly designed using monoprints, with drawings. They certainly evoke the energy-sapping heat and loneliness of the landscape. Only at night does the reader have any sense of a cool that might offer some relief. Mixing tones of brown, gold, orange and green Linda Wolfsgruber helps the reader understand the pain that is felt with every trip up one side and down the other side of the next, and then the next, sandy obstacle. "You can learn so much about cinematography from taking photos. Taking photos not only helps you understand light, framing, and composing images, but it also helps you become a better storyteller. And that's what cinematographers do: we tell visual stories..."
This is the fourth, and last, book in the Learn to Speak series from Owlkids. As with the others which dealt with fashion, dance and music, this book takes a step-by-step look at the subject of film. It begins with inspiration and ends with the work it takes to get what you have worked so tirelessly at for a long time into someone else's hands, and to the public. Michael Glassbourg does a great job of letting his audience know about the many separate parts of the process of making a film. He introduces himself, upping his credibility with young film enthusiasts who will now know that he is very involved in acting, directing, and writing. He explains that he loves to share that knowledge and goes on to do exactly that in 6 chapters that start with the stories we all have to tell, and end with getting the film you have made to an audience. In between, he engages his readers by providing all sorts of lively conversation about the pictures, the script, the process from pre- to post-production. "OK, you've got your digital camera and you are itching to do something with it. First of all, get used to holding if. Get used to all the buttons because you'll have to find those without looking. It's useful to have something specific to accomplish while you are learning, so here are two things to try that will teach you a lot about visual storytelling and cinematography." It's hard work, but worthwhile. There is a lot to learn, and Mr. Glassbourg certainly sets readers on the right path. He makes great suggestions for movies to study, and even has other professional film makers add their ideas for readers. The design is clear, and attention getting. There are tip boxes, 'try this' suggestions, and 'film fest' ideas that suggest looking at the works of others and meant to inform the learning. Quotes from noted leaders in the field add to the appeal. An appendix entitled 'Roll the Credits' breaks down the roles of the many who work on a film. It showcases a number of careers that are part of the film industry. There is much here to attract the attention of those who have an interest in film itself, or in the art that is movie making. "Scout's wings hum to life, so fast that they are almost invisible, lifting her into the wide sky. She rises in a spiral, up and away from the hive. Scout remembers what she passes as she flies, so later she can return home. She knows the sun will guide her, too." Scout is just that...she is a scout for the other bees in her hive. She is the one who searches for the flowers that will nourish the hive. In doing so, she must find shelter from weather, from danger and the threat of an early demise. Once she has found the blooms that will sustain her fellow workers and allow them to make the honey that will feed them through the winter, it's a quick trip back to the hive for assistance. "Scout is safe inside the hive at last. She begins a dance on the wax comb. floral scent on Scout's body." Fascinating facts are shared, and promise heightened interest in the plight of the honeybee, as they face colony collapse and we face a world much changed by their declining numbers. The author offers some simple solutions to help increase bee numbers. The mixed media artwork created by Brian Lovelock is both impressive and inviting, showing Scout in a bold, graphic style finding her way through lovely watercolor autumn scenes that are often delicate and protective. The warmth of the yellows, oranges, golds and reds encourages dreamy observance. The details of the anatomy of the bees and the beehive itself make for a visual feast that matches the feast for the bees themselves. "For the next few days everyone had to sell or give away their meager belongings. They were ordered to pack what they could drag in carts or carry...and leave! "Where will we go, Momma?" Anna asked." I first fell in love with Patricia Polacco's stories of her family when I read The Keeping Quilt in 1988. Since then, I have made sure that each and every one of her books has a place on my 'keepers' shelf. She has an uncanny ability to share what is closest to her heart. She honors teachers for the work they do, and writes poignantly about family members and people from her life who have had an impact on the way she lives today. We are privileged to be able to share her stories. So, we come to The Blessing Cup. It is a perfect companion to her Keeping Quilt. In that book, we met Anna, Patricia's great grandmother as she made the long journey to a new life in a land of promise, America. In this book, we meet Anna again; but, it is her story of life in Russia before leaving for America. "Inside of this pot was a note. It was from my aunt Rebecca in Minsk. It read, 'Rachel, this is for you to celebrate your marriage. This tea set is magic. Anyone who drinks from it has a blessing from God. They will never know a day of hunger. Their lives will always have flavor. They will know love and joy...and they will never be poor!'" The family is not worried about what they do not have because they have each other, and that brings great richness to their lives. The tea set remains a beacon of abundance and beauty for the young Anna. When the pogroms force them to flee their homeland and work to emigrate to America, they take the tea set with them. It is a reminder that they will always have those riches, no matter what. The time it takes for them to prepare for their new life is hard on the family, especially for Papa. "Always remember, dear friend. You are the bread that fed us. You are the salt that flavored our lives. You are the love and joy that held us together. Your golden, kind heart makes you rich indeed....You shall never be poor! I am leaving our precious tea set in your good keeping. We kept one cup so that we can still have its blessing among the four of us. It is all that we will need." 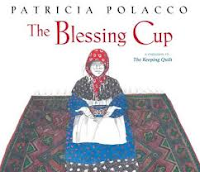 That cup remains in Patricia Polacco's home today, along with the keeping quilt that has so enriched the lives of her family. Her black and white pencil sketches drawn to accompany this lovely family story are brightened only by the most relevant images...the tea set and blessing cup, the babushka from Russia, the Persian rugs that afforded a new life in America, and the keeping quilt that warms Anna's knees as the story comes to an end. Enjoy every single splendid spread! "We take a long time settling down after supper. The cabin is small, and it is hard for all of us to sort our belongings and get into our bunks. My arm throbs, and there is a red bump where the doctor injected the needle. The engines grind, and the noise is so close to my ear that, even on the top bunk, I feel as if I am resting right on top of the machinery." In this compelling piece of historical fiction, we meet Miriam and her family. They have moved to New York City following intimidation and attack by the Cossacks in their Russian homeland. The first part of their journey leads them to East Berlin, but their future there seems destined to be more of the same treatment. To them, America is the land of opportunity and their father works very hard to earn the money needed to emigrate. He goes on ahead of the rest of the family. His letters home are full of encouragement. Two years later when the family prepares to set sail for America themselves, changes must be made. Miriam's baby sister is not well enough to travel, her younger brother will not leave his home or his grandparents, and her mother will not leave without them. Miriam must make the trip alone. Once she arrives, her search for work begins. Two wage earners will get the rest of the family to America more quickly. Miriam works for the Shirtwaist Kings, finding new friends and purpose in her life. The company owners have little regard for their workers. The Triangle Shirt Waist Company nothing to offer protection; in fact, the conditions are appalling. The descriptions of the working atmosphere are both scary and intolerable. When a fire breaks out in the factory where she works, Miriam is lucky to get out alive. Many do not. Leaving Kiev to escape the cruelties of the pogroms in the early twentieth century often led immigrants to a different kind of despair. Irene Watts tells her well-researched story with vivid detail and heartfelt compassion for those who sought a better life in a new world. The March 25, 1911 factory fire changed life as they knew for so many families. 146 workers (almost all of them women) died that day. Ms. Watts gives a clear accounting of the conditions that led to the tragedy; she manages, through her very strong characters and Miriam's first person narrative, to make us a part of the terror of the fire and its aftermath. She has also written a detailed and informative historical story concerning world communities and the highs and lows of immigrant life for many, always with Miriam at the forefront. It is chilling to think that more than 100 years later a similar event led to the death of 1,127 (almost all of them women) in the collapse of a garment factory in Bangladesh. It is tragic that history keeps repeating itself, despite our ever growing awareness of such injustices.